Literally the day before our trip, while starting the task of packing our stuff, Derek said he bought a present for the trip and walked me down to the foyer where a brandy new Canon DSLR camera was waiting! I had been wanting one, finally deciding to get one this Christmas with my earned Cafepress money. 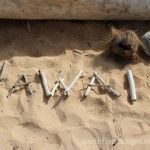 He didn’t want to wait that long and felt we’d regret not having one in Hawaii for all the scenic views. Sunrise at the Hyatt – Hawaii time is 6 hours earlier than east coast time so yes, we were very messed up most of the trip! The first day we woke up at 3:30am but waiting until 6 to head out to watch the sunrise near the cliffs at our hotel. 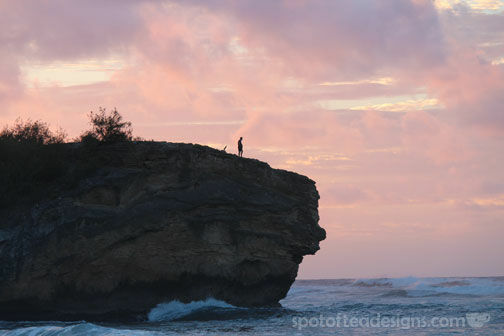 There is apparently a trail that leads up to this spot for a better view, but I preferred having this hiker as a silhouette in my sunrise shot. 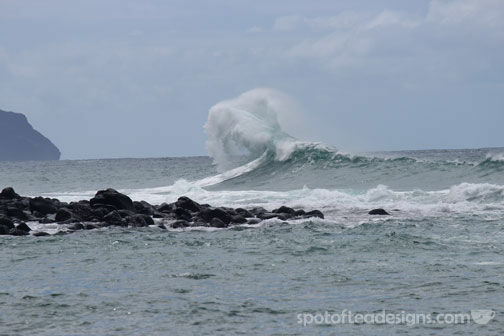 Wave – Our new camera came with 2 lenses, one for shorter portrait shots and one as a zoom lens for closer shots. 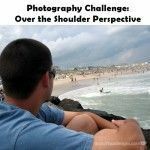 D was obsessed with using the zoom lens to catch surfers making their moves or to see the makings of a good wave. The top photo represents the best of the latter. 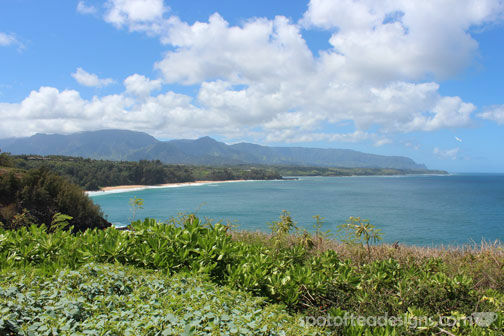 Wildlife Refuge on Kauai – We happen to come across the free day of this Wildlife Refuge so we of course decided to ride up to see the beautiful views it offered, such as the above scene. 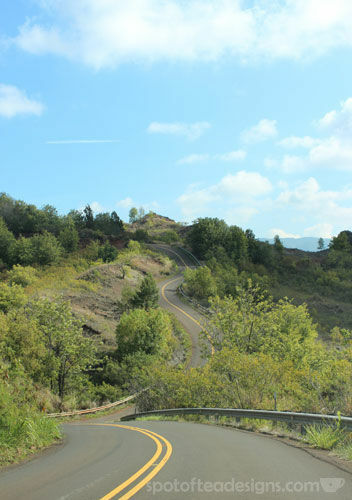 Winding Road to Waimea Canyon – I told you they were pretty winding! This was one of many examples of this view along the route. Keep those hands at 10 and 2! 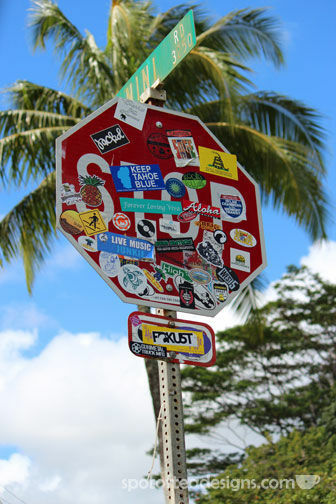 Stickered Stop Sign –Stickers from surfing brands and shops covered many of the public signage at beach access and stop signs around Hawaii. 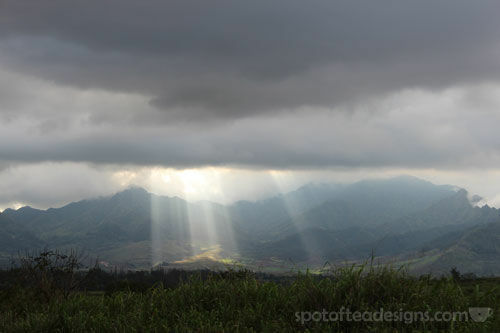 Central Oahu Sun’s Rays – On our drive back from the North Shore, we came across this big open field which showed the sun’s rays breaking through the cloud to the fields below. 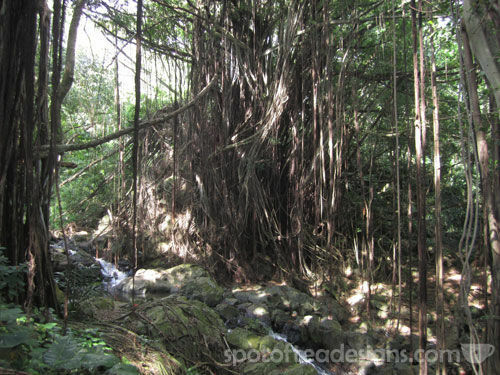 Kapena Falls – Right before leaving on the last day, we followed one more trail recommended in the book to check out some falls. They were ok, surrounded by locals who were jumping off the cliffs, but I thought the trees along this hike were the cool looking parts of the walk! 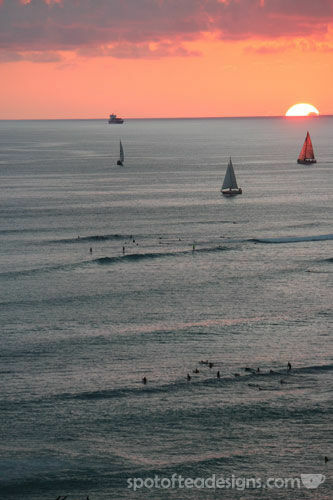 Sunset from Marriot Waikiki – The scene at our balcony one night before dinner. Sunset, sailboats and surfers.